I could have used this idea when my boys were babies! I had to quickly catch a falling stroller more than once! Weigh down the front wheels of your stroller burdened with a jam-packed diaper bag hanging on the handles, by simply attaching ankle weights just above the wheels. Of course, you could simply buy some Stroller Weights or even Ankle Weights, but that is not frugal. If you can sew, and have an old pair of jeans you no longer wear, (or any other tightly woven cotton or woven nylon), you can cut out a couple of rectangles of fabric - 13 inches by 5 inches. This one is a bit more work, so I will simply link to the sewing instructions. Can't Sew?? No problem! You can make ankle weights out of an old pair of tube socks (sew closed any holes first!). Tie a knot about one-fourth of the way up a long tube sock. Pour beans, rice, or sand into the sock. Tie a second knot in the sock, about one-fourth the way down from the top of the sock. 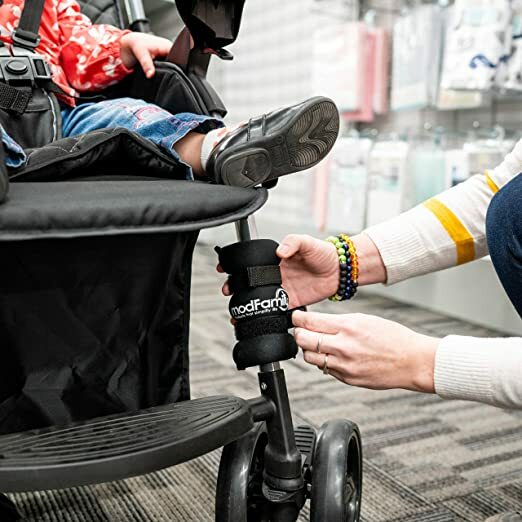 Now your weight is secured in the center of your sock, and the ends of the sock are empty — so you can tie them around the front legs of your stroller. If it isn't long enough to tie it easily, attach stick-on hook-and-loop fastener strips, such as Velcro®, to the sock to fasten it. Simply wrap them on the front legs of your stroller, and off you go! • Steady Stroller Weights - Whether you have a jogging stroller, a bassinet stroller, a full-size stroller, or another type of stroller, these weights are the perfect travel companion for parents. • Anti-Tip Stroller Bags - When you clip this reusable shopping bag onto the front frame of your umbrella stroller, it redistributes the weight back towards the stroller's center of gravity to keep your stroller standing. • Stroller/Pram Safety Wrist Strap - designed to ensure the safety of your baby and control of your stroller when your stroller out of your hand.